The 700 block of Sansom Street is known as Jewelers Row, the oldest diamond district in America. Five buildings between 702 and 710 Sansom St., plus one building on South Seventh Street, are in the path of a proposed Toll Brothers condo development. Several tenants along Jewelers Row that sit in the path of a proposed Toll Brothers development have received eviction notices, requiring them to vacate their businesses and apartments in the coming weeks. Some tenants were told they must vacate by May 31. The 700 block of Sansom Street is composed of mostly three- and four-story buildings, many of which have narrow jewelry shops on the ground and are topped by apartments and small work spaces upstairs. At least four tenants between 702 and 714 Sansom St. told The Inquirer that they had been ordered to leave. For three years, Toll has attempted to piece together approvals to build its first high-rise in Philadelphia in place of five Sansom Street addresses, as well as 128 S. Seventh St. — and has faced resistance at nearly every turn. After Toll’s plans for a residential tower were disclosed in August 2016, the Preservation Alliance for Greater Philadelphia, in partnership with other preservationists, swiftly moved to nominate some of the targeted properties for Philadelphia’s historic register. The Philadelphia Historical Commission in 2017 postponed a decision on whether to designate the properties amid legal challenges surrounding the development. And when Toll obtained demolition approval from the city in 2016, the Preservation Alliance again pushed back with appeals on the approved permits. Mayor Jim Kenney also weighed in that year, calling Toll’s plans “deeply disturbing" and implored the developer to consider preserving the facades of the buildings at the development site. Toll moved forward with different variations of its high-rise, with the support of some property owners and jewelers on the row. While some were opposed — signs such as “The Jewelers Do Not Support Toll Brothers” still hang on some doors and windows — many others expressed hope that the tower could breathe new life into a block that some shop owners say has seen a dwindling number of stores and customers. Now, however, it appears that many of the obstacles blocking Toll’s development are gone. In April 2018, Toll completed its final required review by the city’s design review board, and both of the Preservation Alliance’s court challenges in the Court of Common Pleas and the Commonwealth Court failed last year. Toll still holds active demolition permits, and in June and August 2018 it received new zoning and use permits. In June, the builder obtained a zoning permit to demolish the buildings and build a high-rise tower with 85 units, bedecked with rooftops and balconies. The August 2018 plans show 24 floors of residential units, plus two additional floors to serve as space for machinery. The permit that Toll secured in August also grants zoning approval for an underground parking garage. Toll’s previous permits also consolidated 702-714 Sansom St., plus 128 S. Seventh St., into one lot. The 712-714 Sansom St. properties, however, would not be razed. Reached by email, Michael Duff, a Toll spokesperson, said the company “has no comment to provide" about its plans. Before the developer could proceed with construction, however, Toll would need a new construction building permit, according to an L&I spokesperson. The circulation of eviction notices comes just days after Kenney and Councilman Mark Squilla announced the rollout of new administrative initiatives and legislation to better protect Philadelphia’s historic properties. The announcement, attended by some of the city’s top planning leaders, came after nearly two years of research by the city’s historic preservation task force, which Kenney formed in 2017. In announcing the initiatives — which include a citywide survey to document historic properties and a zoning bonus for developers who contribute to a new Historic Preservation Fund — Kenney spoke about the city’s rich history. “These actions will help preserve what makes Philadelphia unique — our historic assets,” he said at the news conference. The 700 block of Sansom Street was not always the site of the city’s diamond district. Developed in the early 1800s as Carstairs Row, a block of nearly identical rowhouses, it became more commercially focused decades later, with many of the original buildings having been demolished. After the Civil War, the block was known as “Publishers’ Row," before giving way to jewelers in the early 1900s. Today, the block is home to a diverse mix of jewelry owners and tenants, some of whom worked their way up from being extra hands in jewelry stores while in high school to running their own shops. Maryanne Ritter, who runs her namesake jewelry company at 704 Sansom St. — one of the properties that would be demolished — said she has been in the area for 47 years, including 19 running her own store. She currently rents and received an eviction notice last week. She said she has not been able to find a new space. “This is why people come to Philly, to see the history, and now it’s getting whittled away a little at a time,” Ritter said. Other shop owners and tenants in the path of Toll’s development declined to comment. 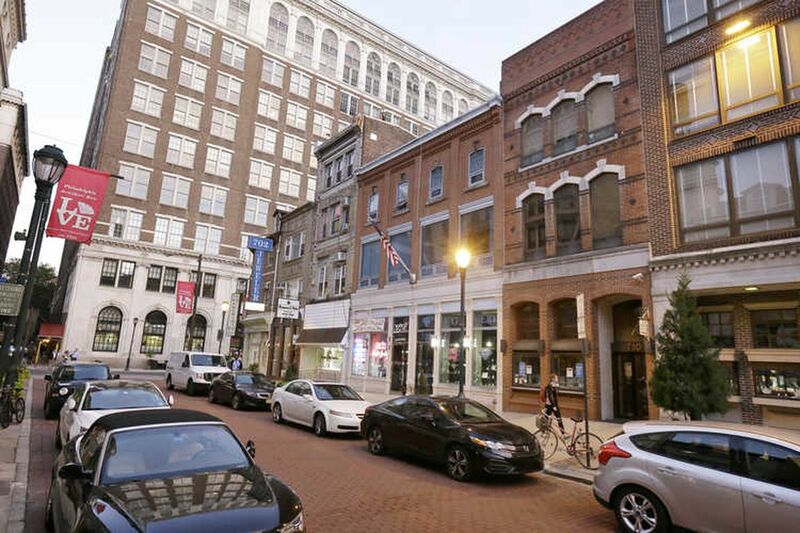 For now, a nomination for Jewelers Row to become a historic district — submitted by the Preservation Alliance in March 2017 — is still pending, though Paul Chrystie, a spokesperson for the Historical Commission, said it would not be heard by the panel until August. Toll can “proceed with the demolitions," Chrystie said, as the demolition permits were not subject to Historical Commission review. In 2017, PRDC Properties, secured a zoning permit allowing for a six-story addition to be built at 740 Sansom St. on Jewelers Row to house 54 residential units. The permit leaves the current property intact, and the company said in 2017 that there were no immediate plans for any construction.